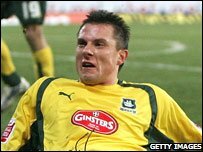 Plymouth Argyle's Hungarian defender Krisztian Timar has signed a new three-year deal to keep him at Home Park until the summer of 2011. The 28-year-old was voted player of the season last term and won his first international cap last year. "He is a very important player to us and it is very good to have this sorted out," manager Paul Sturrock told the club website. Timar is recovering after fracturing his forehead at the end of last season. "I know Kris is popular with our supporters and they will be delighted he has shown this commitment to the club," added Sturrock.